The City of West Palm Beach is building a selection of new pedestrian and boat piers at the entrance to the Clematis Street entertainment district. 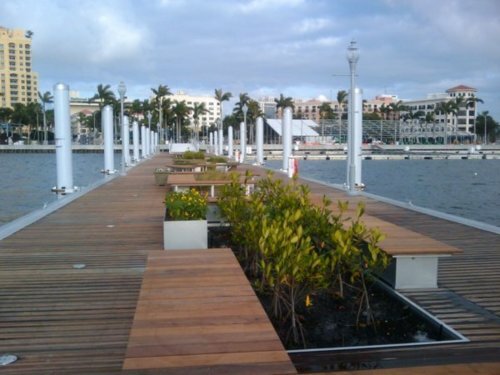 The main pedestrian pier off S. Clematis Street should be open to the public sometime in the month of April. It's 444 feet long, which is about the equivalent of 1 1/2 football fields! It has benches, plants, and a lot of other neat stuff. It is a floating pier but you won't be able to feel it moving, so don't worry, it won't make you dizzy. But over time as the tide goes up and down, the pier adjusts to the water level. Here is an advanced view of what it will look like if you walk down to the end of the pier and look back toward Clematis Street.